Each year, Women & Gender Studies at Eastern Kentucky University awards Charlotte Rose Schmidlapp Scholarships to students whose abstracts are chosen for inclusion in the proceedings of the Herstory Conference, an annual event co-sponsored by the EKU Department of History, Philosophy, & Religious Studies. Recipients for 2019 are Karly Lainhart (1st place, $1500), Anna Nelson (2nd place, $1000), and Kelsie Head (3rd place, $500), and they will be presenting their full papers at the 14th Annual Herstory Conference on March 21, 2019. In addition to the essay contest winners, a fourth Charlotte Schmidlapp Scholarship goes to Abigail Rhiannon Cain, a Social Work major pursuing a minor in Women & Gender Studies. 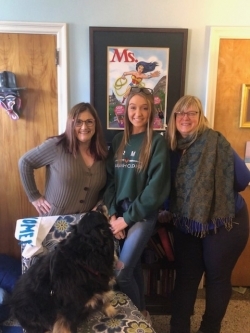 Rhiannon will use the scholarship to fund her Summer 2019 study abroad experience in Paris, France—an especially poignant gift due to the namesake of the scholarship. The Schmidlapp Scholarship fund is made possible by Jacob Schmidlapp, the son of German immigrants who settled in Cincinnati, Ohio, where Jacob started a small bank that would eventually grow into Fifth Third Bank. However, along with his abundance of wealth came an abundance of tragedy. In February 1900, the Schmidlapp family traveled by passenger train with the hopeful destination of Florida; as they passed through Missouri, their train was stalled by blizzard conditions, and because of poor visibility a second train collided with theirs, killing Jacob’s wife, Emelie, and their older daughter, Emma. A few years later in September 1906, Jacob took his nineteen-year-old daughter Charlotte to Paris, where she had long dreamed of going; plus, Jacob wanted to buy her a beautiful dress for her debutante ball later that year. While they were driving and admiring the Arles countryside, a farmer backed his horse-drawn cart onto the road too quickly for the Schmidlapp vehicle to stop, causing a collision that killed Charlotte immediately. EKU honors the memory of Charlotte Schmidlapp by providing scholarship funds to students who are obtaining their education in order to further themselves in ways that Charlotte was not able to accomplish.